If you wanted to learn how computers work, but didn’t know where to begin, this book is for you. If you are a programmer, but learned entirely from tutorials on the web, this book can fill in a lot of the background information you missed. 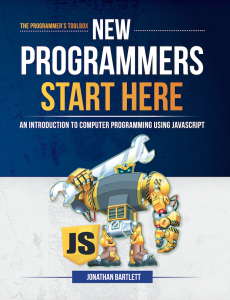 New Programmers Start Here is an innovative introduction, focused not just on providing a specific skill, but also helping provide the background and mindset needed to be an effective programmer in the long term. This website provides supplemental information to the book, including video walk-throughs of several of the exercises, material for teachers using the book, and a forum where readers can go to ask questions and help each other.